Surprised no mention anywhere of forecast strongish winds late Friday and Saturday yet. NetWeather forecast has my backyard down for 34 sped and gusts well into 60s. Is it anything to be concerned about or just a 'usual' winter storm?. Gales west maybe severe gales further north. Interesting one to watch. Normally this will downgrade the next few days although it's certainly upped a few mph since yesterday evenings run. 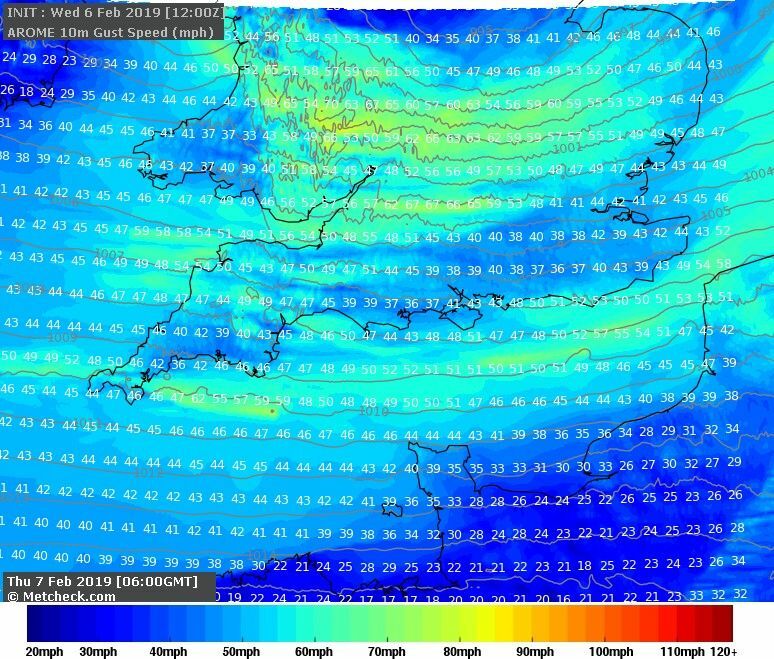 This winter the models have been also quick to jettison strong winds at short notice as well. Another feature Wednesday night might bring some windy conditions to Yorkshire as it tracks from south western Ireland to north east England. If it develops it will be worth keeping an eye as it could bring notable issues to a small area of the UK. Dunno about Winter early spring storm ???? Thanks everyone... yes my mistake, I did mean a 'usual' autumn/spring storm. No downgrades yet and yes Pit, I am just a few miles down the M1 from you so keeping an eye out tomorrow night too. Definitely upgraded since yesterday,looks further north to earlier runs today. Great local forecast for Tonight and tomorrow. 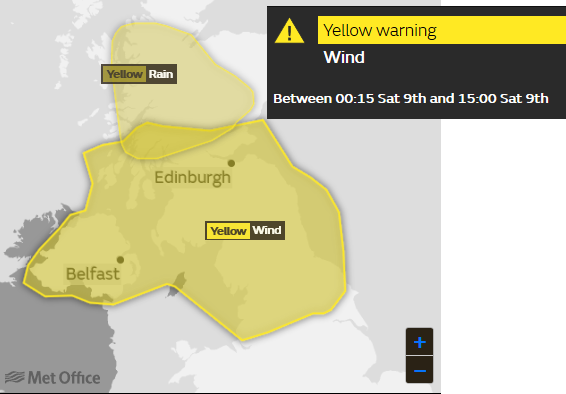 A warning for strong winds but no strong winds in the local forecast. The met office on this need to get the act together. They just look plain silly. 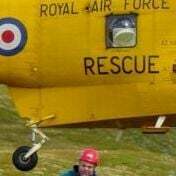 Right going to the GFS. The low still forms but a bit delayed and it spreads a very narrow band of very strong winds through Liverpool area which moves east to be leaving east yorkshire and the hull area by midday. A very narrow band of gusts to 60 mph. A shift north or south will take this narrow band out of the equation. I would gamble 80 miles either side of the area may get hit. It may still not even happen. This is just the warm up for Friday and Saturday with widespread winds and gusts to 60 maybe higher in exposed parts. So some interesting weather which I like if it's not going to cold. 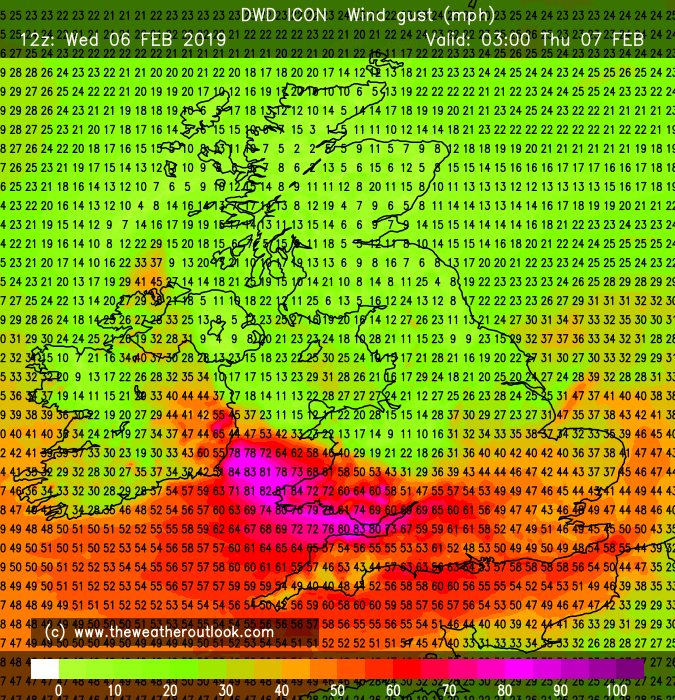 Worth noting the Arpege and ICON are both showing potentially damaging wind gusts to central and southern areas later tonight, The Arome is showing something similar but the GFS seems to take the winds across northern England and much weaker, in my eyes the GFS tends to either underestimate or overestimate and I think it is underestimating the strength of this low tonight. 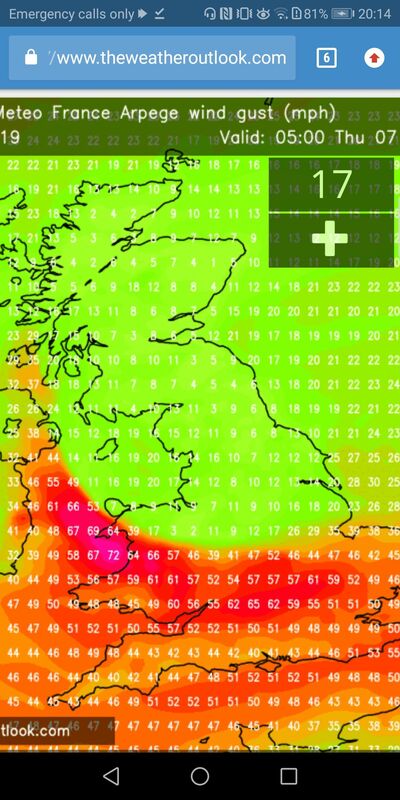 Gusts of between 55 - 65mph are shown to effect a large swathe of England and Wales but lasting no longer than 4-6 hours.. I would say there's a high degree of uncertainty over this secondary feature. We will know by morning possibly literally. Gusting to 67mph at the Scilly's. The wind is just starting to pick up here too. 38mph gust out of nowhere. It's like a switch was flicked on. A cosy night! nothing apart from some rain here. 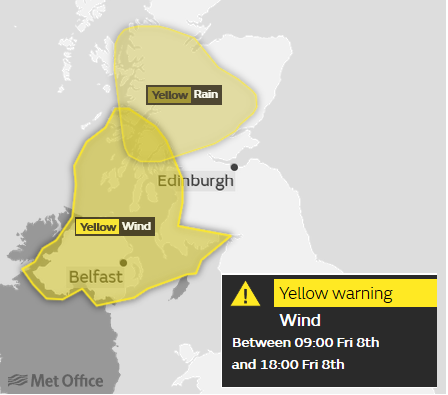 Interesting to note the Met Office have reduced the extent of the warning areas for strong winds, with the yellow warning for said wind now confined to Northern Ireland and Western Scotland for Friday, and extended east across most of Southern Scotland and Northern England for Saturday. Of course there's time for that warning area to be extended again but it goes to show how hard to forecast and volatile these set-ups can be. How this deep low is not yet named by the UK Met office when its only 24 hours away is beyond me, its been in the forecast for a few days of a deep low hitting widely across the UK, yes of course where the strongest winds will be is still a bit uncertain as the models toy where the real pinch in the isobars is going to occur but there should of been more warnings out on the TV by now and it is yet another sham in respect of this storm naming business when in theory its a good idea to name these really deep lows. In my eyes, it looks like the strongest of the winds on Friday will be across coastal western areas but inland parts of Northern Ireland and Ireland could well see severe gales, and then Saturday morning looks like there could be severe gales widely across Northern England and Southern Scotland. I would not be surprised too see gusts of upto 80mph to the east of high ground as the winds 'bounces' over the Pennines. Once someone has named the Storm, then both Met Offices use it. Met Eireann often get in first as their criteria for an orange/amber warning is lower, and defined by wind strengths. UK Met Office look at impacts. I need to stop looking at MO warnings on Firefox, display is absurd. Why have they removed the warnings in the South? The forecast wind gusts down here are stronger than they were last night, and for a longer duration. Ridiculous! Not even worthwhile drying out my sodden clothes and work bag after this morning. The 'joys' of mild winter weather. Hopefully downgrades to come. Bored of wind and rain after November and December (where it belongs). Managed to escape last night with a max gust of 36mph. 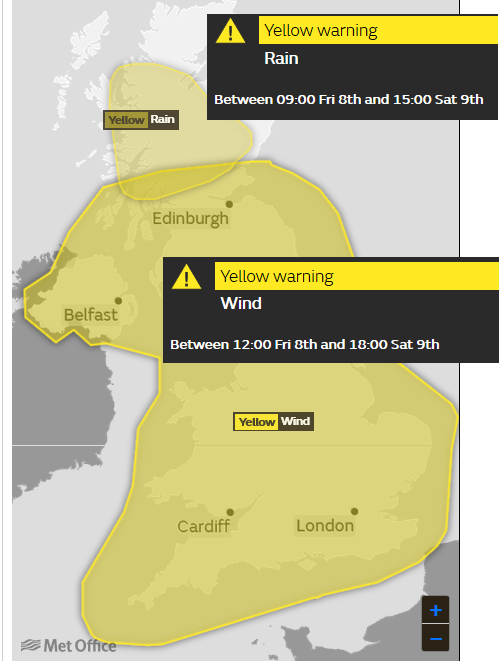 In my opinion to simplify things and have clear start and end points for each warning colour they should be based on expected wind gusts and whether it's a rural or urban area.So for wind something along the lines of 60-75mph being a yellow warning for coastal or upland and lightly populated areas, 75-90mph being amber and 90+ being red.For towns and cities 50-65mph being yellow, 65-80mph being amber and 80+ being red.